Tracking density altitude, air density, and grains of water on race day is useful for a strong tune-up. Many racers bring portable weather stations to help dial in their setup. You already bring a trailer full of tools with you to the track. A portable weather station is just one more item to lose or break. Did you know that over time, portable weather stations lose accuracy without regular calibration? That's one more thing you need to do. If you just want a quick reference while at the track, check out the list of real-time weather pages on this site. Each track's page uses weather from Dark Sky to provide current density altitude and other weather information. Weather is updated approximately every 20 minutes. The US race track list also features a 3 day forecast of air density, density altitude, and grains for planning in the days leading up to a racing event. Future plans include adding historical weather data and other updates. Currently there are just over 600 tracks worldwide with more being added all the time. If you don't see your track in the list, contact us and we'll add it to the site. If you get the current temperature, humidity, and barometer from a local weather report, online calculators like this one provide density altitude. This calculator also provides uncorrected barometer, air density, grains of water, vapor pressure, and dew point. The page also provides an elevation calculator for barometer correction. Registered users of the site can also use a calculator that returns weather data at a provided location. 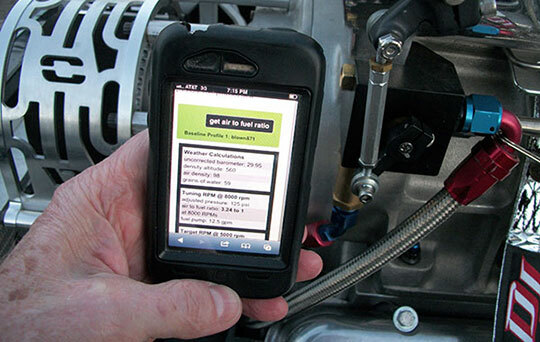 If you race mechanical fuel injection and want a portable jetting calculator, ProCalc can provide jetting calculations from your smartphone. Weather calculations are combined with your saved baseline data to provide custom jetting for your setup. 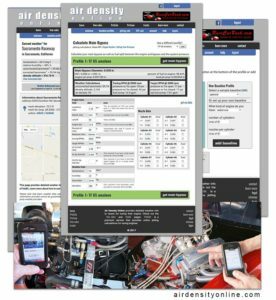 If you want to brush up on how to use all this data at your next race, check out our tuning articles or check out our partner site, RaceCarBook.com.